Do you remember the first time one of your friends showed you how to write a text message—and explained why verbs had become such old-hat? It broke the rules. But it made sense. Writing for the web also requires a fresh approach. For example, taking material from a newspaper and pasting it into a web page does not work. 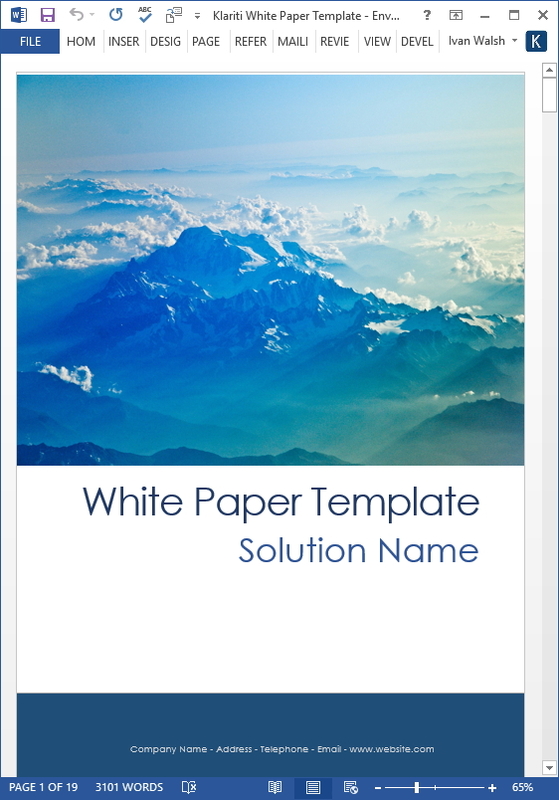 Royalty-free MS Word White Paper templates. a grasp of the web’s unique requirements as regards content. Effective web writing draws in visitors to your site, encourages them to explore, and ‘do business’—the driver behind every commercial website. Let’s look at three ways to fine-tune your web material. Before you write a word, develop a profile of the typical readers who will use your site. Once you’ve defined your target readers, you can tailor the content accordingly. Imagine if you didn’t know who they were? Your writing would be bland, vague, and mediocre. And the response to your website would reflect this. When you understand your visitors, you can then anticipate what they will want to do at your site. Because when they visit a site they want ‘to do’ something; for example search for stats, book tickets, or chat with other fans. As websites are about making things happen, every word should help your visitors reach this goal. Remember: users often have several windows open simultaneously, so you need to grip their attention quickly. Use short, clear, and informative text to do this, which also brings us nicely to the next section. Quick question. How do readers read on the web? They don’t. Once you know this, you can prepare your content so that the ‘key words’ stand out. In other words, when the reader scans the page, they will find the key word they’re after, and then zoom in on that section. Examples of keywords on a football site could be: Owen, tickets, Keegan, UEFA, fan clubs, away matches, tours and so on. Your text should be rich with keywords as these are the terms typed into Search engines to find your site. Tip: When converting content from print publications to the web, aim to reduce the word count by 35-50 percent. Readers don’t have the patience to read long scrolling text. Reducing headings to less than 10 words. Keeping paragraphs below 70 words max. Have you noticed how cold and impersonal most Government documents tend to be? They generally adopt a neutral tone, avoid emotional words and phrases, and rarely speak to ‘YOU’. Maybe in time this will change because of all the words in the English language ‘YOU’ has the most impact. Experience web writers know that putting readers at the heart of the site will encourage them to visit, stay onsite, and return. Just like in the high street, it’s repeat customers that you’re after. Make visitors feel welcome to your site. Show that you care. Offer tips, advise and links to pages that you think will interest them. Don’t make them do all the hard work. After all, it’s their business that you’re after! Sites that talk down or address readers ‘from a height’ will never attract repeat visitors. Why should they? There’s always an abundance of competing sites to visit, some of which are bound to hit the mark. Indeed, getting the right tone is always difficult when writing. And it’s further complicated on the web as you can’t see your readers. You know they’re out there. But, you can’t see the reaction on their faces when they read your ‘special offer’ on your homepage. Do they think it’s crass? Or are they reaching for the phone bursting to place an order? Your challenge is to centre the site on their needs. Write the material from their perspective. Help them navigate through the site. Make sure they don’t get lost, offer signs, directions and other helpful devices. If they do get lost, help them back. To recap: visitors want to do something on your site. Remember that beleaguered Liverpool supporters who wanted to buy tickets online? Your visitors are the same. Don’t ever leave a visitor thinking: what do I do next? Refine and polish every word, link, phrase, headline, heading, sub-heading, and paragraph until you’ve made sure that the reader ‘connects’ with you. Because it’s only then that your site will start working for you.